Lt. General James Longstreet served in the Confederate Army in high command positions from 1861-1865, from Manassas to Appomattox. "Old Pete" (nickname) became known as Lee's "Old War Horse" and the best fighter and corps commander in the Army. Despite a distinguished military record and several brilliant victories where his prescience, strategic vision and well-executed tactics saved the Army of Northern Virginia from certain destruction, General Longstreet was unfairly scapegoated and blamed for the loss of Gettysburg (and the war itself) for many years after the conflict. Despite these good efforts there remains a strong sentiment among Longstreet's modern-day admirers that more can and should be done to rectify the wrongs heaped upon "Old Pete" and his family for the sake of honesty and decency in the treatment of heroic (if controversial) figures and American History itself. At a time when the nation's values, its character and leadership development qualities seem at risk, especially with the younger generations, the challenge to reinvigorate American history is daunting. Yet, serious students of our political process recognize that historical lessons and a revival of "old-fashioned civic values" will be critical if the nation is to realize its potential for greatness and contain the spread of the "poison" politics of personal destruction, greed and corruption. Just as these negative, media-driven barrages took a toll on Longstreet and his family and countless other Americans, we are all reduced by these vicious, orchestrated falsehoods. Our history becomes distorted and truth becomes a casualty. Moreover, we as a nation are nullifying, even negating the enormous sacrifices made by our ancestors, particularly the noble soldiers like Longstreet, if we permit the erasure from history of their lives and achievements --the actions which have created our current bounty. James Longstreet's life encompassed much of the tumultuous nineteenth century. As a West Point-trained officer, Longstreet served with distinction in the Mexican War and matured with the young nation's Manifest Destiny, honing his military skills in the rough wilds of the West. Longstreet knew the frontier and its values, and he drew strength and vision from his experience which served him well in the Civil War and beyond. Longstreet's struggles with the exigencies of the South's military situation and his acute awareness of broad facets of the interlocking tragedy which unfolded after Appomattox did not inoculate him from one of American history's cruelest outbreaks of scapegoating and ostracism through which he endured an unrelenting barrage of personal attacks on his military record and beliefs. For nearly four decades Longstreet stood against the ill winds, did his duty, and helped the country grow into an industrial power. SHADY MARKERS -- Little evidence of Old Pete remains in his adopted Georgia hometown -- except his gravesite, a remnant of his hotel, and a stone marking the site of his Park Hill residence (above). The General's house burned to the ground with his war memorabilia and papers under mysterious circumstances in 1889 (see Gainesville Revisited). Longstreet's hotel (Piedmont), a commanding three-story structure which he operated from 1875 to 1904, was demolished in 1918. Serious students of American history need to understand Longstreet's life, especially after his last great battle at The Wilderness (where he was nearly killed by accidental wounding) -- what happened to him and why it happened to gain a fuller understanding of what has transpired in the past one hundred and fifty years. There are profound lessons for all of us in understanding Longstreet, his trials and times, especially during the sesquicentennial years (2011-2015). LYNCHBURG -- In this house General Longstreet recovered from near-fatal wounds sustained at the Battle of Wilderness. 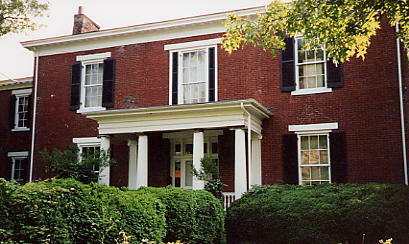 His stay here was brief, as he was moved south to a more secure location in Augusta, Georgia. The General Longstreet Recognition Project (GLRP) is broadening awareness of James Longstreet and translating his achievements and honorable life into a colorful series of events (i.e., Wilderness memorial tribute, a videotaped interview about Longstreet-Grant Friendship 1839-1904) ultimately designed to elevate Longstreet's memory. develop a speakers clearinghouse to assist writers, experts and others interested in having Longstreet's perspective presented at various Civil War programs, reenactments, and theatrical productions. GLRP is achieving these objectives by blending its activities with public relations and legislative/education programs on the national level in cooperation with others who share GLRP objectives (e.g., Longstreet Memorial Fund, Longstreet Memorial Association, various preservation groups and Civil War Roundtables). GLRP is chronicling Longstreet's military achievements through key battles such as the Wilderness, Chickamauga, Second Manassas and Antietam where the General's participation was decisive. The aim of this prong is the erection of a monument and/or other physical markers to provide more lasting recognition of the General's presence in important engagements. Another prong will illuminate Longstreet's post-war life, especially during Reconstruction. 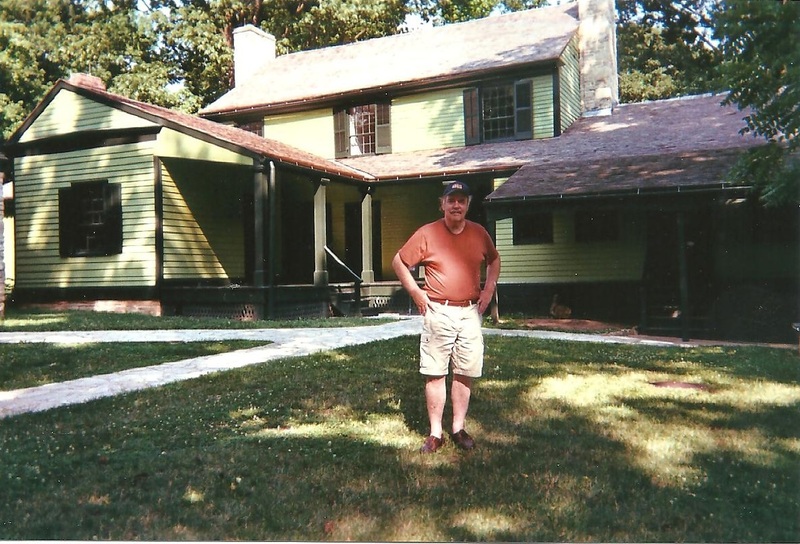 GENEALOGICAL TRACES -- Retired Brig. General J.L. 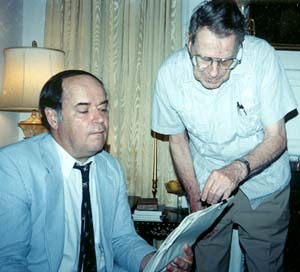 Sibley Jennings (right) points out Longstreet family links with the Randolph and Jennings families to Nick Hollis in Milledgeville, Georgia. Hollis' great grandfather, William Nevinson Jennings, was born near Perry Georgia before the Civil War." 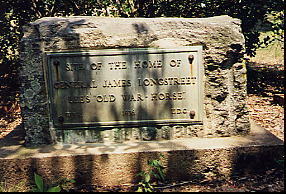 Despite the resurgent interest in James Longstreet, there is a distinct possibility that current memorial/preservation efforts will fall short of realizing the potentials which exist now for a more sweeping rehabilitation of Longstreet's reputation. Many of the same obstacles which blocked earlier campaigns for Longstreet, particularly political residues held over through flawed scholarship, remain intact. Some of these negatives have become almost institutionalized within the bureaucracies of government institutions and universities which control disproportionately a large share of resources available for historical preservation purposes. These agencies and their network of professional historians are unlikely to view Longstreet rehabilitation as a priority. Other potential allies such as Civil War clubs and battlefield preservation organizations may provide only mixed support, despite their members' interest in Longstreet. Organizers are renowned to restrict their fundraising energies to programs which they control and/or will result in a contribution check made payable for their organization's use. It is a challenge to locate magnanimous Civil War program spirits, but they do exist. The General Longstreet Recognition Project (GLRP) is generating positive benefits for participant historians and students interested in a unique case study of how one military commander demonstrated leadership on the national stage within a complex weave of issues providing a window on his time. Longstreet's contributions to U.S. military and politics are reflected in his own complex interests at a water-shed period of U.S. history. GLRP is helping to illuminate Longstreet by generating publication and educational materials. GLRP is enhancing the communication networks among those seeking to advance Longstreet-related interests, and serves as an informal association effort to accelerate the "Longstreet revival" driving the remaining negatives from the field. GLRP is achieving its objectives through standard research, publications and event education techniques in cooperation with Washington area-based research institutions. This research is supervised and conducted by a trained historian with advanced-degree education and publication experience. GLRP enlists support, initially through a non-financial enrollment process. This muster is reaching "critical mass" due to favorable newspaper coverage (see clips). Various units are organized for specific research and/or event implementation. At present GLRP is receiving support from The Agribusiness Council (ABC), a nonprofit and tax-exempt organization based in Washington, DC. A special account has been established. The Agribusiness Council (ABC) continues to demonstrate interest in researching prominent leaders who have contributed to America's rural development and/or who exemplified moral courage in pursuit of the national interest. ABC's late chairman, U.S. Senator Jennings Randolph of West Virginia (1902-1998), was an admirer of General Longstreet and a distant relative through the Fitz-Randolph family. Randolph shared Longstreet's keen interest in military technology, but was most remembered for his pioneering efforts in international peacekeeping. ABC president, Nicholas E. Hollis, also has family ties through his mother (Jennings family) ancestors of William Nevinson Jennings (1847-1934) with roots in Tennessee, Louisiana, North Carolina, Vermont and Virginia. Financial support for this project is underway with contributions from individuals, foundations and organizations interested in General James Longstreet and American history (Civil War/Reconstruction). State agribusiness associations with historical interest programs and/or specific Longstreet links are being solicited for assistance in promoting the GLRP as part of a review of twentieth century figures who contributed to regional/national perspectives on rural heritage (i.e., Jennings Randolph Recognition Project, etc.). The various Civil War research centers at universities may also be approached for specific project activity support. WILDERNESS TRIBUTE CAMPAIGN EXPANDS -- GLRP's memorial/wreath-laying service at the site of Longstreet's accidental wounding at Wilderness has sparked a broader campaign. Nick Hollis (with binoculars) discusses expansion of the viewing area at the historic marker with NPS ranger. Hollis reiterated this proposal during a lecture before the Friends of the Wilderness and recent discussions with NPS rangers/historians. Program was featured in Fredericksburg Freelance Star front page story on May 19, 2002. In the aftermath of Election 2000 and the contested Florida vote, historians are reminded of the infamous, deadlocked Tilden/Hayes presidential struggle of 1876-77. But how many will look deeper and find Longstreet's courageous leadership, commitment to duty and the national interest? We know "Old Pete" was a central figure during Reconstruction in Louisiana, but how many realize the enormous impact his actions had on history? For more information, read "Old Pete at Liberty Place: Links to 1876 and Election 2000." Also check the publications section of this website to obtain a copy of Nick Hollis' speech on this subject -- "James Longstreet: A Profile in American Courage," before the Mahoning Valley Civil War Roundtable in Youngstown, Ohio (October 9, 2000). 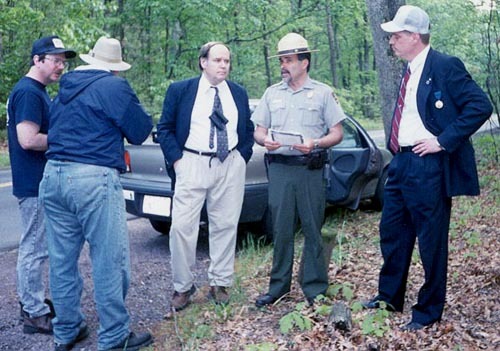 LEGISLATIVE CAMPAIGNERS -- Nick Hollis greets U.S. Rep. Herb Bateman (R-VA) outside of the hearing room where testimony was presented to the House Subcommittee on National Parks and Public Lands to preserve the Wilderness Battlefield (July 1999). Bateman's bill (H.R. 1665) passed and was signed into law. 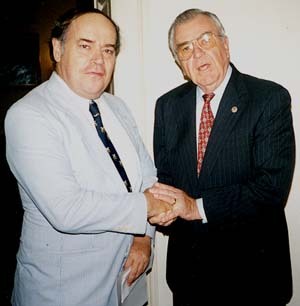 Rep. Bateman passed away in September 2000. (6) spearheading "campaign" for Longstreet's broader recognition via links with key relationships (i.e. U.S. Grant, Robert E. Lee, and others -- see Fredericksburg Freelance Star). (7) evaluating "historic preservation" programs, including questionable commercial groups which abuse public trust and Longstreet's honor by soliciting funds in his name. GLRP's "campaign" for honest history focuses on Longstreet's courageous life as an example for all Americans, particularly young people. 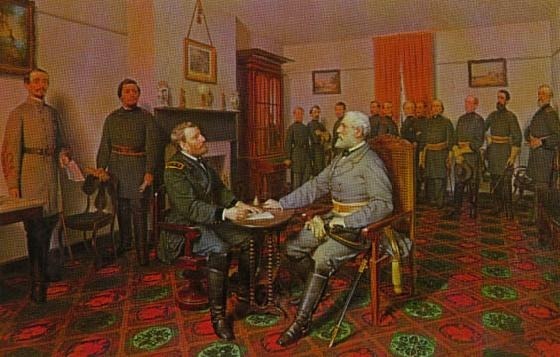 Longstreet's friendship with Grant and his advice to Robert E. Lee were instrumental in the reconciliation process which began with the surrender at the McLean House.